For most of the farmers, it’s their first trip back to the Capitol since the Farm Bill was approved, and given the bill’s overwhelming support, there will be many members to thank. There will also be a lot of new members to educate about the importance of maintaining the no-cost sugar policy in the face of a struggling rural economy. From record product launches to multimillion-dollar expansions, what a sweet year it was for candy manufacturers. As consumers’ demand for candy products continues to surge, America’s confectioners are gladly taking advantage of this growing market. And America’s 142,000 sugar farmers and workers are thankful to be a part of their success story. The global sugar market remains in turmoil, plagued for years by a subsidy-fueled oversupply. And as foreign sugar businesses struggle to stay afloat, governments around the globe are taking action. Unfortunately for the market, the action being taken by most governments is to increase subsidies, which further depresses prices. Last week saw two governments – both big and small – intervene. Sugar is widely considered the world’s most distorted commodity market. Global sugar prices have fluctuated more than 200 percent since 2008 alone and often fall well below the cost of producing sugar. Why? Because of the actions of a few government-dependent producers…. Members of the American Sugar Alliance (ASA) praised Congressman Ted Yoho (R-FL) for taking decisive action against foreign sugar subsidies with today’s reintroduction of the Zero-for-Zero sugar policy. Brian Grunenfelder will work alongside veteran ASA Trade Adviser Don Phillips in helping analyze the complex global trade issues that impact U.S. sugar farmers and shape America’s no-cost sugar policy. The holidays got a little happier for farmers and ranchers today as President Donald Trump officially signed the 2018 Farm Bill, and with it, extended U.S. sugar policy for another five years. Sugar producers have been vocal supporters of the new Farm Bill, which they say will help rural America cope with slumping commodity prices and extreme weather. We want to thank Senators Pat Roberts (R-KS) and Debbie Stabenow (D-MI), Congressmen Mike Conaway (R-TX) and Collin Peterson (D-MN), and all of the Conference Committee members for working tirelessly to produce a bipartisan bill that will keep America’s farm safety net strong. The Farm Bill passed today contains a strong sugar policy that will give sugar farmers and workers a fighting chance to survive in a market that is plagued by low prices and ever-increasing foreign subsidies. Sugar policy will likely come under attack when the bill moves to the Senate floor. Farm policy opponents have signaled support for a legislative proposal that would exclude sugar producers from loans available to other crops, mandate market oversupplies with subsidized imports, and send sugar farmers’ prices back to 1980s levels. On the eve of a pivotal vote, which could have effectively cut America’s sugar producers out of the Farm Bill, the Wall Street Journal editorialized against U.S. farmers and in favor of subsidized foreign industries. Agricultural critics are looking to cut U.S. sugar farmers out of the Farm Bill, effectively leaving them vulnerable to a new slew of foreign trade abuses and falling prices. 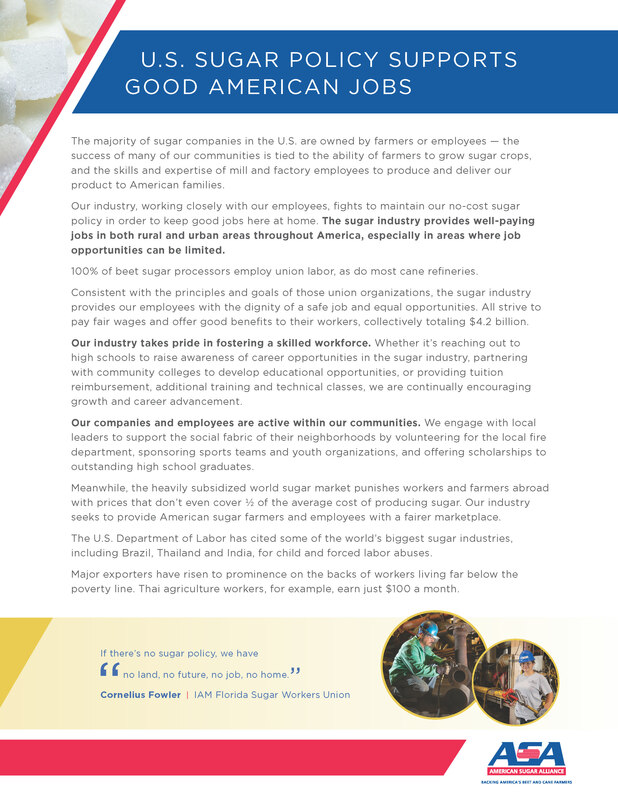 The American Sugar Alliance sent a letter to leaders of the House Agriculture Committee yesterday, thanking the panel’s members for supporting sugar policy and asking for support in defeating possible Farm Bill amendments. Nearly 60 banks and Certified Public Accountants sent Congress a letter opposing the Sugar Farmer Bankruptcy Bill. Sugar prices tanked when Mexico broke U.S. trade law and flooded the market with subsidized imports years ago. While that problem has been addressed, the aftereffects are still lingering. America has had a sugar policy in some form since the country was founded. And Louisiana was the first place where the crop was planted – tracing its roots back more than 200 years. Sugar is widely considered the world’s most volatile commodity market because of widespread subsidization. The Rutherfords, like other American sugarbeet and sugarcane farmers, rely on a U.S. sugar policy comprised of import limits and producer loans to cope. ASA launches new campaign to show lawmakers what’s at stake for cane and beet farmers across the country as they debate the future of sugar. Carolyn Cheney was a pillar in the world of agricultural policy – a testament to doing things the right way and building relationships that stand the test of time. Today, her colleagues, friends, and family laid Carolyn to rest and celebrated a cherished life and career. All four members of the House and Senate Agriculture Committees’ leadership took time to address the annual meeting of the American Sugarbeet Growers Association in D.C. – a testament to the importance of the sugar industry to our nation’s agricultural economy. ASA released an infographic noting that sugar producers see just 2 cents from a $7.99 heart-shaped box of chocolates. When sugarbeet grower Kendall Busch learned of a scathing attack on his U.S. Senator for supporting an industry that has meant generations of reliable, good-paying, jobs in Nebraska, he was pretty upset. Two weeks after President Trump made a bold promise to farmers to produce an on-time Farm Bill, his Department of Agriculture (USDA) took the next step and introduced a list of legislative principles to guide the upcoming debate. Sugar producers’ biggest concerns heading into 2018 revolve around the Farm Bill and trade – specifically keeping America’s no-cost sugar policy strong. ASA releases final installment in four-part “Sugar Shorts” video series that explains how U.S. sugar policy works. Sugar has been called the world’s most distorted market. Our third “Sugar Shorts” video explains why. Amendments designed to gut no-cost U.S. sugar policy were rejected during the 2014 Farm Bill debate, but their backers are dusting them off for another run. As the holiday season kicks off, Americans will be reaching for a staple in their pantries. From pumpkin pie to cookies for Santa, U.S. households have relied on domestic sugar supplies for generations. This Halloween will be full of the same old stale rhetoric from well-heeled multinational companies that want to outsource America’s sugar production. U.S. sugar policy is spelled out in the Farm Bill. Congress has started debate on the 2018 bill and will continue to discuss it into next year. Farm Policy Facts, a coalition of farm organizations including ASA, spoke with sugar farmers and, today, kicks off a three-part sugar harvest series. Attacking individual legislators is never a smart political move since the critics are lobbying those lawmakers to outsource some of our food production. Galen Lee, President of the American Sugarbeet Growers Association, discusses the non-recourse loans found in the Farm Bill in a recent Agri-Pulse piece. Outsourcing U.S. sugar production to subsidized foreign producers is atop Big Candy’s legislative wish list. It boggles the mind that one of the few — if not only — government programs designed to operate at no cost continues to come under attack. Our farmers suffer when foreign countries dump heavily subsidized surplus sugar on the world market to protect their own interests, according to Jack Roney. Sugar producers took the time to address lawmakers during a recent Farm Bill listening session in Minnesota. Ervin Schlemmer called on Congress to maintain U.S. sugar policy and to make research funding a priority in the news Farm Bill. With so much attention on Mexico, chances are good you lost track of all the other foreign subsidy developments around the globe. ASA didn’t. 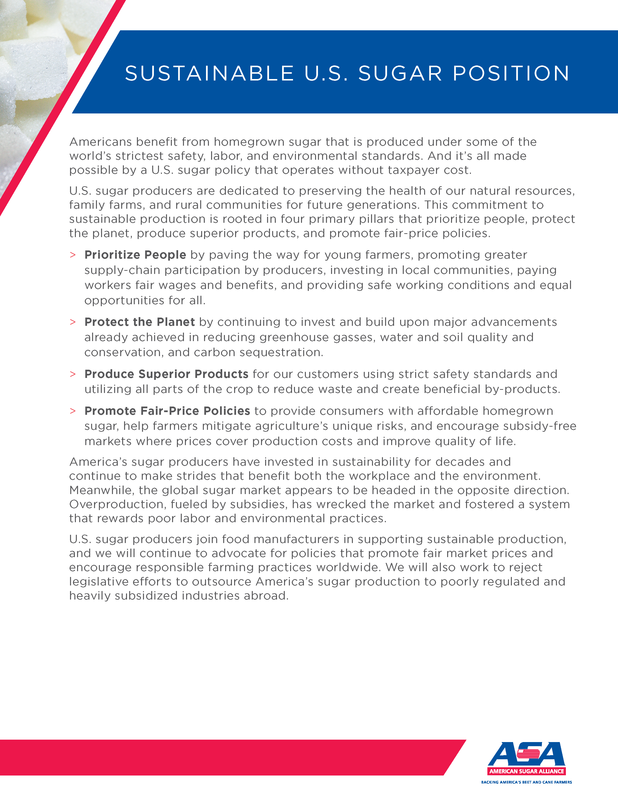 Both letters, penned by American Sugar Alliance Chairman Jack Pettus, are included. America’s sugar farmers and producers today informed the Department of Commerce (DOC) that they support the agreement to bring Mexico’s subsidized sugar industry into compliance with U.S. trade laws. The pledge was made after DOC tightened the agreement. The debate over whether Mexico’s subsidized sugar industry will be held accountable for violating U.S. trade laws has been getting a lot of press coverage lately. In 2015, the U.S. government found Mexico guilty of both dumping and subsidization. Yet Mexico is still dumping. When does aloha mean goodbye? After Mexico broke U.S. trade laws and ran Hawaii’s century-old sugar industry into the ground. There are dozens of foreign producers who responsibly and fairly supplied the U.S. market for the decades before Mexico began gaming the system. Hopefully this week’s talks will move in the right direction and towards suspension agreements that finally stop the injury caused by Mexico. Mrs. J.A. Tiedt sat down at a table across from a high school teacher in Culver, Indiana, 75 years ago this month and became the first person in her town to receive a book of sugar ration stamps. It was May 1942 and World War II was raging across Europe. Sugar was the first food staple rationed by the U.S. government during the war. Josh Buettner’s piece for the Market to Market segment spotlighted Alexander & Baldwin’s decision in December to shutter the Hawaiian Commercial & Sugar Company operation on Maui as an example of how the U.S. sugar industry is struggling in a world market that is manipulated by foreign governments.